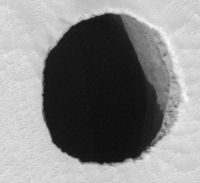 Natural Caves have been found near the volcano Arsia Mons on Mars. The caves are a possible location to establish a human settlement. They could be re-constructed to become big habitats. The caves would provide shelter and plenty of space for housing. They could, perhaps, also be a source for water and rare minerals. Nadine Barlow said: "Caves on Mars could be good places for long-term ice accumulation and that would make them ideal locations to look for life on Mars as well as valuable reservoirs for water to support future human exploration of the planet." Is there a danger to occupy volcanic caves for human settlements due to possible volcanic activity? Nobody knows the actual geometry of the Martian caves and whether they are usable or not. An exploration is necessary to find it out before the start of detailed planning. 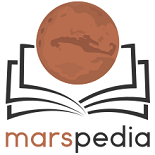 ScienceDaily: Are These Caves On Mars?